Warner Bros. Pictures and Amazon are teaming up to offer Amazon Prime members a chance to see Aquaman one week prior to its theatrical release. The comic book-inspired action adventure film will screen in select AMC, Regal, National Amusement Theaters, and ArcLight Cinemas on Saturday, December 15, 2018. Tickets are now available exclusively to Amazon Prime members. According to Warner Bros, up to 10 tickets at any of the 1,000 theaters involved in the special advance screening may be purchased by each Amazon Prime member. 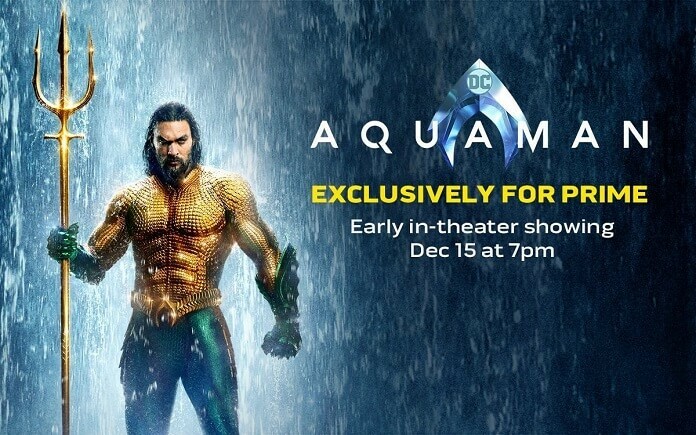 For more details or to buy tickets, visit www.amazon.com/AquamanMovie. James Wan directed from a screenplay by David Leslie Johnson-McGoldrick and Will Beall. The film’s based on DC characters created by Paul Norris and Mort Weisinger. Peter Safran and Rob Cowan served as producers, and Deborah Snyder, Zack Snyder, Jon Berg, Geoff Johns, and Walter Hamada executive produced. In addition to Jason Momoa (Game of Thrones), the cast of Aquaman includes Amber Heard, Willem Dafoe, Patrick Wilson, Dolph Lundgren, Yahya Abdul-Mateen II, and Nicole Kidman. Aquaman‘s set to swim into theaters in 2D, 3D, and IMAX on December 21, 2018.